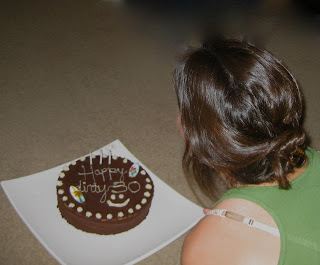 Little Miss recently celebrated three decades of existence and Yuan threw a shindig for the most joyous occasion. For me, no celebration is complete without a feast and no feast is complete without a carcass! 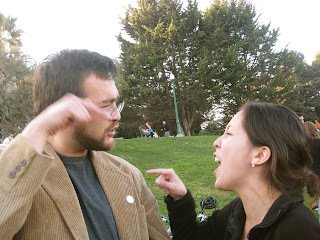 But first, we spent an afternoon people-watching, drinking cowboy margaritas, and munching on filet mignon, gorgonzola, watercress sandwiches in Dolores Park. It was a beautiful afternoon, there were many cute doggies I wanted to dognap and some sibling bickering following a couple cowboy margaritas. As the sun went down, we migrated to Yuan’s apartment where Yuan had prepped a dinner of all of Little Miss’s Favorite Foods. 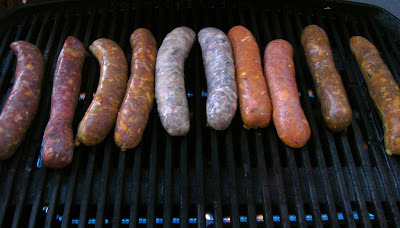 Yuan fired up his mini-grill and grilled up five varieties of sausage – Wild Boar & Beer Sausage, Duck & Pork Sausage, Toulouse Sausage, NFL Buffalo Wing Chicken Sausage, and Merquez Spicy Lamb Sausage. 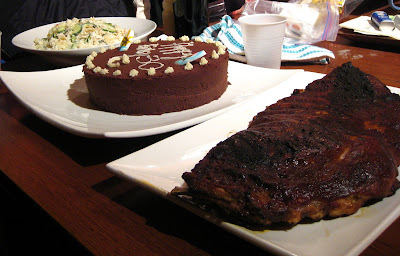 Yuan also grilled ribs and I made some dungeness crab potato salad and a two-layer birthday cake. 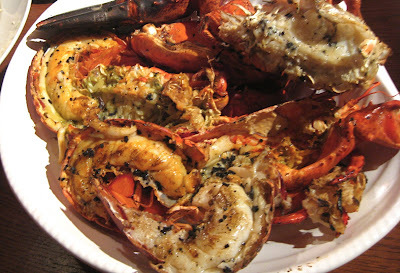 And of course, a meal feting Little Miss would be amiss without our wondrous crustacean friend lobster… especially when he has been grilled and slathered with truffle butter. After everyone else was done eating and cleaning up to prepare for dessert, Little Miss and I decided that we would not let Mr. 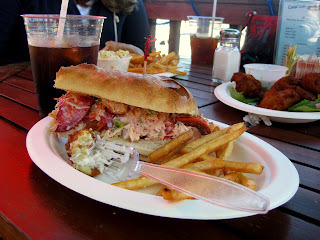 Lobster die without enjoying every tiny morsel of his truffle butter soaked succulent self. 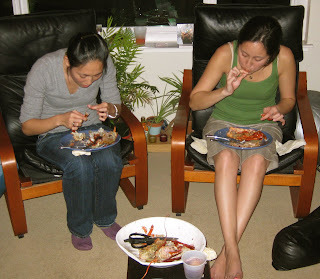 The two of us brought the platter closer and did our duty as Asians and lovers of New England seafood. It was the least we could do to thank Pinchy for his ultimate sacrifice. He would’ve wanted it this way. We finished off with cake – another one of my recent baking experiments. One layer of the sponge cake was quite good (Gourmet magazine recipe), the other dry and not so good (Joy of Cooking recipe), but I got to play with some frosting and it was fun to make. Next time I will use just one recipe and it will be more delicious. Little Miss blew out her candles and we had a night out on the town. Fun day and great dinner with good friends and family are what celebrating birthdays are all about. background clam fritter. also delicious.